Spring has sprung…and brought with it all the things that cause spring allergies. One thing many people aren’t aware of concerning allergies is that people can develop them at any age. 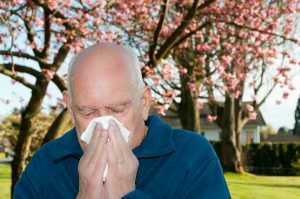 So, even if your older family member has never had problems with seasonal allergies, it’s possible for them to suddenly have symptoms this year. Allergies are caused by the body mistaking something, like pollen, for a dangerous substance. In response, the immune system releases antibodies to combat the substance. Histamines are released into the blood, causing the person to experience the symptoms of allergies. Spring allergies can be triggered by many different kinds of pollens. Pollen from trees is the biggest problem for most people in the spring. It can travel on the wind for miles, so even if the older adult doesn’t live near trees, they can still be affected by tree pollen. Pollens from different kinds of grasses and weeds can also cause allergy symptoms. Feeling stuffy or having a runny nose. An itchy feeling in the sinuses, ears, or throat. A feeling of the ears being plugged. Darkened circles under the eyes. Keep an eye on pollen counts, which are typically reported on local news programs. If the counts are predicted to be high, the senior should take allergy medications even before they feel any symptoms. Keep doors and windows closed to keep pollen outside. Use an air conditioner or fans to cool the house. Use high-efficiency filters in the senior’s air conditioner and furnace. These filters capture pollen, keeping it out of household air. Plan indoor activities when pollen counts are high. Use over-the-counter allergy medications according to the instructions on the label. If symptoms are severe, talk to the doctor about stronger prescription medications.